Our theme this fortnight at the International Art & Soul Challenge is Layer It Up. I attended the Stamp & Scrapbook Expo in Mesa, Arizona, in September with my Mom & her crafty friends. We had lots of fun, and of course I got some great deals, which I used to make this card. 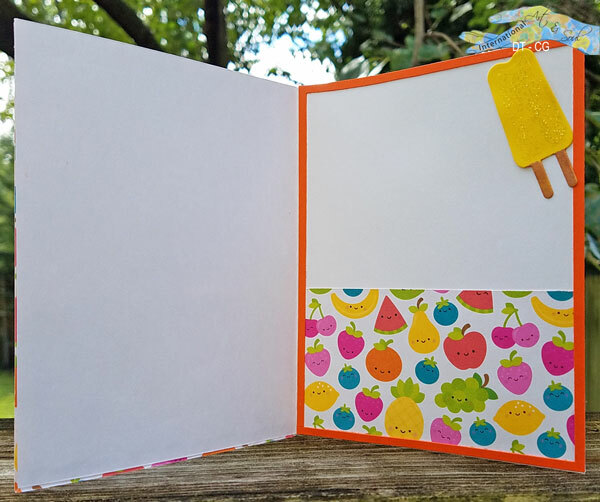 The popsicle-shaped shaker & fruit sprinkles are from Queen & Co.; the fruit & polka-dot paper is from Doodlebug; the double popsicle & cherry dies are from Spellbinders; the lemons are from Elizabeth Craft Designs; and the striped paper is from the Expo's handbook! The sentiment die-cut is also from Spellbinders, but from my stash. I even decorated the inside. Update: This was chosen as a Top 3 for Through the Purple Haze #148! This card is so cute inside and out ! I love the bright colors . Stunning card, thx for joining Purple Haze Challenges.